Dolphin Encounter in Cancun Isla Mujeres is a program that allows people of all ages to swim with dolphins in the Caribbean. For anyone visiting Cancun, Mexico, this is an opportunity to see these friendly creatures up close and interact with them. Children and adults alike will enjoy meeting and learning all about dolphins at the Dolphin Encounter. 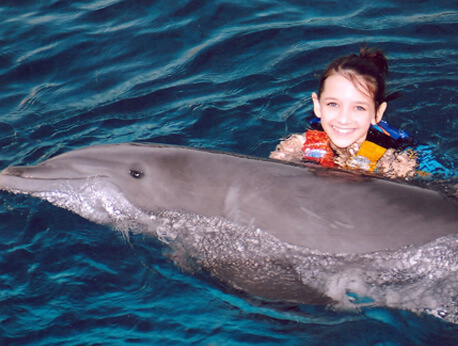 If you’re visiting Cancun, Mexico, the Dolphin Encounter is one of the most memorable activities you can enjoy. The program is designed for people of all ages and swimming abilities. In fact, you can interact with dolphins even if you don’t swim at all, as there’s a platform from which you can meet and touch dolphins without getting into the water yourself. Dolphin Encounter is held on Isla Mujeres, a beautiful island in Cancun. It’s a relatively short ferry ride to get from the mainland to this island where you can meet the dolphins. This is a nice place to relax and enjoy the scenery before and after your dolphin experience. The island features turquoise waters and white sands. If you want to enjoy other activities such as kayaking or snorkeling, you can do so at Garrafon Park, a protected area on the island. One of the nice things about Dolphin Encounter is that it takes place in the Caribbean Sea. Some dolphin swim programs take place in aquariums or pool. It’s more fun for both humans and dolphins to meet them in their natural environment. Although these dolphins are in their natural habitat in the Isla Mujeres, they are extremely friendly and enjoy meeting people. You can actually get kisses and handshakes from them. Dolphin Encounters include a briefing where you learn about the appropriate way to behave with dolphins, a 40-minute dolphin encounter, a buffet meal and use of the facilities at the Cancun Beach Club. The price for this is $109 for adults and kids over 13 and $89 for kids ages 6 to 12. Younger children must swim with an adult. Additional expenses are ground transportation, a docking fee, and photos taken with the dolphins. Please call today to book your reservation and be sure to get all of your questions answered! To book 1-5 year olds please call us.